6 Free things to do in Stockholm you don't want to miss! Dubbed as “The Capital of Scandinavia”, Stockholm offers tourists amazing views and travel experience. Pretty much like any city, Stockholm has its share of both high end and budget-friendly list of things-to-do. Depending on what you want to do and what you want to see, touring around Stockholm can be either really expensive or quite cheap. The best thing about this city is that there’s always something to do, regardless of budget so all you have to do is set a spending cap and make a list of things you’d really like to do, and you’re off! If you’re on a tight budget, however, here’s a list of free things to do in Stockholm. Remember, just because it’s cheap doesn’t mean it can’t be fun. Stockholmers are really proud of their city so much so that there was a group that organizes free tours for newcomers to the city. If you want to get to know the city and learn about its history, then this freebie is for you! All you have to do is visit their website: Free Tours Stockholm and sign up for a free tour. Bonus: you don’t even have to queue for tickets or make reservations! All you have to do is show up at the meeting point. How to get there: The tours start at Sergels Torg, which is pretty easy to find. If you’re coming from the Central Station, just make your way towards Sergels Torg and look for the large staircase. The guides hold a sign that say “Free Stockholm Tour”. Outdoor enthusiasts, rejoice! Stockholm is a city that loves nature and parks are scattered all over this wonderful city. Parks usually don’t have an entrance fee so you’ll get treated to a nice afternoon spent under the Scandinavian sun. Take a walk along Djurgården, follow the water, and perhaps do a bit of bird watching. You could also head towards Kungsholmen and make your way towards Norr Mälastrand and stroll along one of Sweden’s great lakes. How to get there: If you want to go to Djurgården, you could walk from the Central Station. Just head towards Kungsträdgården then down to Strandvägen. There are also trams that go from Sergels Torg near Centralen if you want to save your strength. Going to Kungsholmen is quite easy, too. You could reach it by foot from Centralen and just follow the signs that point toward Kungsholmen. Or if you’re taking the train, jump on the line that heads towards Rådhuset and make your way down to Norr Mälastrand. There are a handful of free museums in Stockholm, so if you’re on a budget, you’re in luck! The Moderna Museet, which houses modern art, and Arkitekturmuseet (Architectutre Museum) do have entrance fees, but you can visit the collection on floor 4 for free on Friday nights at 6-8 pm. Dans Museet (The Museum of Performing and Visual Arts) offers free entrance to visitors. And if you don’t want to go too far, Kulturhuset right on Sergels Torg is also free of charge. How to get there: Moderna Museet and Arkitekturmuseet are both on Skeppsholmen so you could actually visit both without going far. If you’re coming from the Central Station, you could walk towards Kungsträgården, through the park and towards the water (it’s the Baltic Sea). You could also hop on the train and get off Kungsträgården station Just note that these two museums offer free entrance only on certain days. 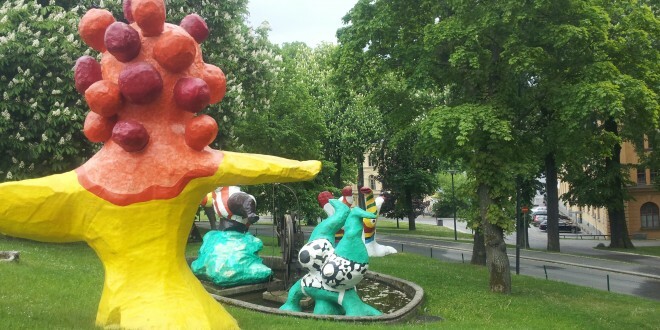 Dans Museet, on the other hand, is near Kungsträdgården and is just right across the park. The changing of guards is quite a sight to behold and it’s free! The Swedish royal family is protected by 30,000 guards which makes their changing ceremony one of the most popular tourist attractions in Stockholm. The changing of guards is done either at 12 noon or 1PM at the Royal Palace. To get there, make your way towards Gamla Stan and up the Palace. From the Central Station, you could make your way to Gamla Stan (or Old Town) on foot by going towards Sergels Torg and following Drottninggatan. Stockholmers love summer and they love to swim! There are a number of areas where you could swim but the most popular one would be Rålambshovsparken or Rålis. Don’t forget to take some sandwiches with you and have a picnic by the lake. How to get there: Head towards Norr Mälastrand. From Centralen, just take the train and get off Rådhuset. From there, head towards Rålambshovsparken by following the path by the water. Summer usually features free concerts from local artists. Just swing by Kungsträdgården park in the afternoon and you might be treated to a special brand of Swedish reggae. I hope you enjoyed these tips! If you have additional ideas about free things to do in Stockholm, please share them below!